Dandelions are perennial weeds that are often adored by children but despised by adults. They bloom both in the spring and fall and use water and nutrients that your grass needs to grow full, thick and green. Fortunately, dandelions are easy to control with the use of an herbicide, but you can kill them in other ways, if desired. Once you kill the dandelions growing in your grass, adopt some key good lawn care practices to keep them away for good. Purchase an herbicide that contains the active ingredient 2,4-D and is safe to use in lawns. It is easier to buy one that is ready to use rather than one you have to dilute. Wait to apply the herbicide. The best time to kill dandelions with an herbicide is in the fall or spring, just after they bloom and are weakest. Pick a day that's not windy and when you have no rain predicted for two days. Wear protective clothing and spray the herbicide directly on the dandelions, but as always, follow the specific manufacturer’s directions for the herbicide you are using. Expect spring dandelions to die within a couple of weeks, but in the fall, you may not notice any difference until spring when they do not regrow. Remove dandelions by hand for small patches or if you don’t want to use an herbicide. Do so when the ground is moist after a rain or from watering. Get at least 4 to 6 inches of the roots. A weeding fork or a dandelion digger will make this job easier. Simply insert the tool in the ground around and under the dandelion and pull up. Clean up the dandelions you pulled and discard them in the trash, not the compost pile. Plant grass seed in their place, fertilize your lawn and begin to mow your grass at a height of 2 ½ to 3 inches to help shade out the small, bare sunny spots where dandelions like to grow. 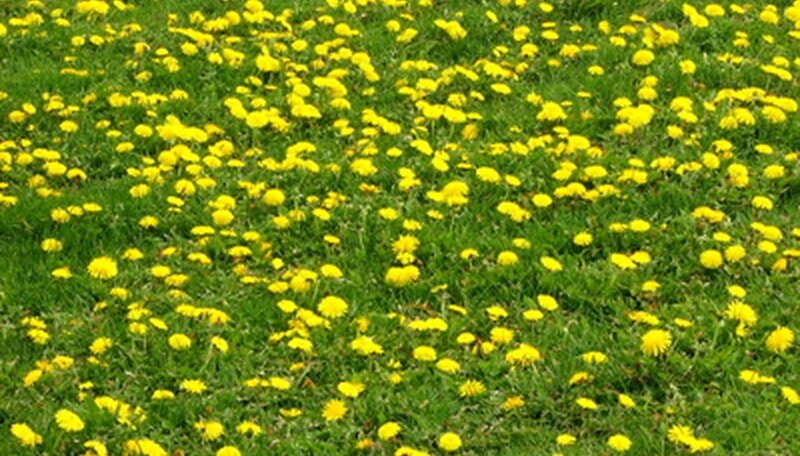 When you mow dandelions, always remove the heads from your lawn so they do not spread seed and infest your lawn further.